On Friday it looked as though the conservative movement was suffering from a personality disorder. 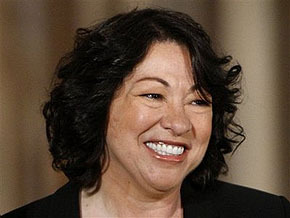 The insane half wanted to brand Sonia Sotomayor as a dull-witted affirmative action hire whose seething racist bitterness would soon turn the Supreme Court into a cesspool of radical retribution against whitey. The adult half thought that although she was obviously well qualified, her generally liberal record ought to be challenged and her judicial philosophy debated. Which side would carry the day? It’s starting to look like we’ve got an answer. Several of those same GOP senators said Sunday that they would now make race a focus of the Sotomayor nomination fight — and they were far less eager to criticize conservatives such as Rush Limbaugh and Newt Gingrich for their racially tinged critiques. Fanning out across network television talk shows, the senators in essence pledged to ask a fundamental question: Can a woman who says her views are shaped by her Puerto Rican heritage and humble beginnings make fair decisions when it comes to all races and social classes? ….Cornyn’s comments were echoed in appearances by Senate Minority Leader Mitch McConnell (R-Ky.); Sen. Jeff Sessions (R-Ala.), the ranking Republican on the Judiciary Committee; and Sen. Jon Kyl (R-Ariz.), another member of the panel that will conduct hearings. ….The GOP senators’ new tone underscored a sense in the party that Sotomayor’s history of speaking about her Puerto Rican heritage had emerged as a surprisingly effective line of attack — particularly as President Obama and other Democrats try to shore up their support among working-class white voters. Oddly enough, Cornyn has never expressed any concerns about whether a white male judge who rules against affirmative action can be a justice for all of us or just a justice for a few of us. I suppose it just slipped his mind. In any case, they say that if you want to know what someone is really like, watch how they react under pressure. That’s probably true of political parties too, and the Republican Party under pressure is finding — once again — that when nothing else works, appeals to racial paranoia are a “surprisingly effective line of attack.” Imagine that.